Beautiful hand painted cabinet with Indian figures and floral borders. 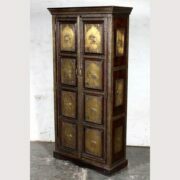 With semi fantastical Indian figures and beautiful floral borders delicately hand painted onto its front and sides, this cabinet is very special. 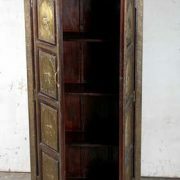 Predominantly dark green and red in its colouring but with vibrant colourful borders and eye-catching male and female figures painted in classic Rajasthani style, this piece opens to reveal four internal shelves that create a generous amount of storage. This truly outstanding piece is in excellent condition we are sure it would take pride of place in whatever home it is chosen for.